The late Karen Lawrence worked at London Glassblowing during the 80s and 90s and we are privileged to be hosting a retrospective of her oeuvre in our gallery between 12-27 February 2016. Click here to view and purchase a selection of her artworks online. 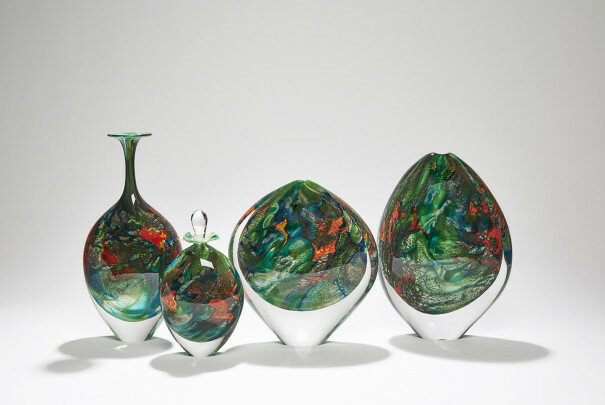 Watch the video below to learn more about Karen through interviews with her husband, the irrepressible singer-songwriter John Otway, along with the founder of London Glassblowing, Peter Layton, and artist & curator Cathryn Shilling. “In February 2016 London Glassblowing is holding a memorial exhibition of the work by my former colleague, Karen Lawrence. Sadly, after a prolonged battle with cancer, Karen died in October 2013. The commute to my studio takes me past her house, so I think of her almost daily. A bright star who shone all too briefly, she was a joyful and optimistic presence, at once serious, questing, passionate, playful and charming to workmates and clients alike. Graduating with a silversmithing degree (first class honours, Buckinghamshire University) she joined London Glassblowing in 1983, initially to help develop the facility to electroform onto glass started by Anna Dickinson. 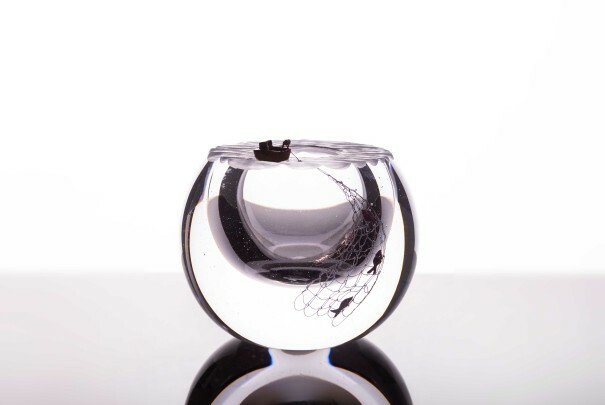 Before long, having already experienced hot glass at college with Sam Herman, she began to concentrate on vessel making the activity that was to occupy her for over 25 years. In 1987 she was my teaching assistant at the summer school at Sars Poteries, the wonderfully rustic glass centre in Northern France. 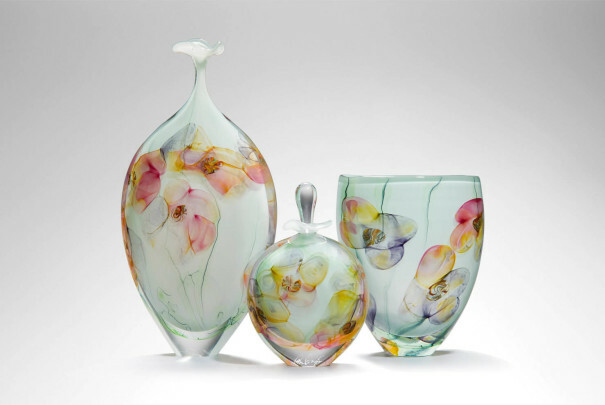 Founded by the glass fanatic and parish priest, Louis Meriaux, it became, along with Novy Bor and Frauenau, one of the main pioneering centres for European studio glass. Throughout the workshop Karen’s enthusiasm and support were invaluable, especially in keeping up with the Pernod drinkers and the ritual French lunches, the last of which cost us dear in that she and I missed our flight home. During the 90’s, much of her energy was devoted to her family; her daughter Amy and her partner, the irrepressible John Otway, singer-songwriter extraordinaire, whose career as ‘Rock and Roll’s Greatest Failure’ she helped promote. With his huge cult following, she arranged major sell-out concerts at the London Astoria and the Royal Albert Hall, as well as the premiere of his epic film ‘Otway the Movie’, at the Odeon, Leicester Square. She drew great satisfaction from her involvement in this brilliant and amusing documentary. Karen developed groundbreaking techniques for making and colouring stunning kiln formed vessels, sculptures and architectural panels. By fusing and slumping careful arrangements of finely drawn strands or filaments combined with specially prepared frits, she was able to achieve exquisite and delicate forms, and effects reminiscent of ice crystals or snowflakes. Pieces were also sometimes enhanced by the addition of electroformed and patinated metals. 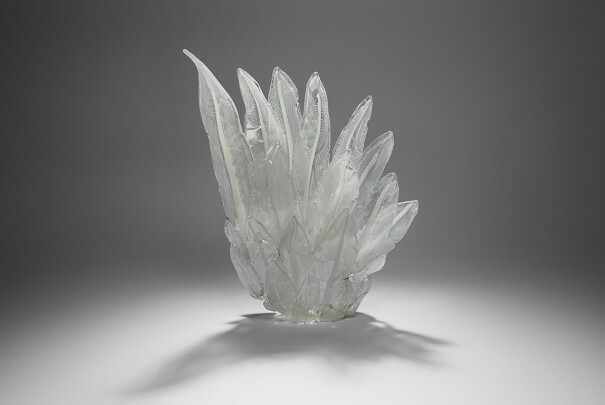 Perhaps her greatest success in this field was in her ability to translate the fragile light-capturing qualities of Pate de Verre to an architectural scale. She won several awards including the Worshipful Company of Glass Sellers’ prize in 2002, for her two metre high ‘Glacier Prism’, a float glass structure with bonded kilnformed glass filigree. Among her most ambitious and enduring works are the extraordinary double-sided screens entitled ‘Waterscape Panels’ commissioned for the Bereavement Centre at St Thomas’ Hospital, London. They incorporated coloured kilncast and etched elements bonded to textured float glass with gold leaf. Since these were too large for her own kilns, she completed these at our previous studio in the Leathermarket in 2008 and it is a measure of her meticulous planning and considerate and gracious nature that having her in our studio again, turned out to be a delightful process for all of us. My last two meetings with Karen were both moving and inspiring. As ever she was keen to chat avidly about her current work and plans, as well as to exchange news and views of the current glass scene. An extremely gracious person she was always willing to share her knowledge and experience with great warmth and generosity. “I joined The London Glassblowing Workshop in 1983 at its Rotherhithe Street location on the River a few doors down from the famous Mayflower pub. We were able to have the balcony doors open from the Thames to keep the workshop cool. I had just finished a silversmithing degree at Bucks University and had a great interest in glass as Sam Herman had just set up a glass course at the college. Peter wished for me to develop the electro-forming work onto his glass and I would spend some time working at the furnace.